I have a new zine out. It is called Mandatory Laxative #14. 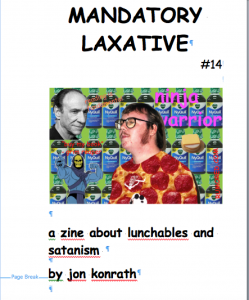 It is about lunchables and satanism. It is 20 pages long. It is printed on an inkjet printer. It is as lo-fi as possible. I didn’t even spell-check it. It is listed on Goodreads here. It is not available on Amazon. It is not available as an ebook or a PDF. It’s barely available at all. It is a limited edition of about 30 copies. If you really want a copy, and you are in the US, paypal me $4 and your postal address. jkonrath at rumored.com.